This is the true peppermint. It is excellent for herbal teas and is also used medicinally. 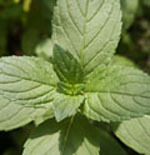 The leaves are smooth and dark green with greenish purple stems. Wonderful scent and flavor for tea.